Note: This game was #27 in the 2010 edition of this list. 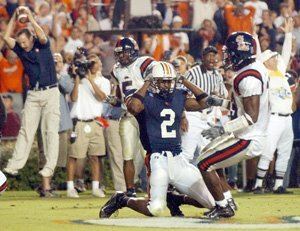 How I Remember It: I think every Auburn fan will forever remember the feeling of our hearts being ripped out of our chest as Ben Obumanu had the ball taken from his hands by the ghost of John Vaught, yes Vaught, not Vaughn. If you don’t know who John Vaught is, here you go. I was on the first row, next to the players’ entrance behind the end-zone where it all happened. Since Obomanu’s back was to me, it looked like he caught the ball, which caused me to jump on to the wall that separates the bleachers from the field, and scream like Auburn had just won the National Championship. Once I realized he dropped the ball, I jumped back down, and threw up a little bit. I’m not really sure why it happened. I’d like to think it was a mixture of embarrassment, sadness, and the huge swing of emotions. Either way, I’m not kidding. Without drinking any alcohol of any kind, I threw up after he dropped the ball. It didn’t matter how bad I felt, though, the feeling Ben had to have after that play was monumental compared to mine. It could not have happened to a worse candidate. Ben has to be one of nicest and smartest players on any Auburn football team ever. It just wasn’t right. However, as we all know, Ben’s career wasn’t defined by this dropped pass. It was defined by tons of touchdowns, big catches, and good character. In a nutshell, I remember a great game against one of Ole Miss’s best teams in years, thanks to Eli Manning. Auburn did enough to win, but it just obviously wasn’t meant to be on that day. What Really Happened: Both teams traded touchdowns on their first possessions. Auburn added a field goal at the end of their next possession as well. Eli threw his second touchdown pass of the day midway through the 2nd quarter, and the score stayed 14-10 going into the half. Starting what seemed to be a career day, Ben Obumanu hauled in a 68-yard touchdown pass in the 3rd quarter as the Tigers took a 17-14 lead. The teams would trade field goals in the 4th quarter, before Eli directed a perfect drive at the end of the game. Ole Miss scored with 2:39 to play to go up 24-20. The rest was as I remembered. Needing a touchdown, Jason Campbell lead the offense down the field, with a big 51-yard run-after-catch by Obumanu. The Tigers had a few plays inside the 15-yard line: the dropped pass and another desperation incompletion to turn the ball over on downs. Ole Miss won their 6th straight SEC game, and had to win one more to get to the SEC Championship. I’m not sure what happened, but they didn’t go to Atlanta (update: they lost to eventual national champion LSU, moron). This loss also knocked Auburn out of any SEC contention, and added more negativity to what was supposed to be one of the better years in Auburn history. Fun Fact: One time, Ben dropped his game jersey in his apartment’s parking lot, and I touched it. True story. Play of the Game: The play that decided the game was the dropped pass, so I guess that’s what I have to choose. Player of the Game: All Disney movies aside, Ben Obumanu had 6 catches for 150 yards, and a TD. He had the best performance of the game, regardless of one play.